Items Included: Wormed at 2, 4, &amp;amp;amp;amp; 6 weeks. Micro chipped, shots, OFA, EIC, PRA, DM TESTS, CLEAR. Overview: The Chesapeake likes to work and is a great retriever. He's bold and strong, so needs a good deal of exercise. Coat: Coat is thick and short with a wooly undercoat. Outer coat is harsh and oily. 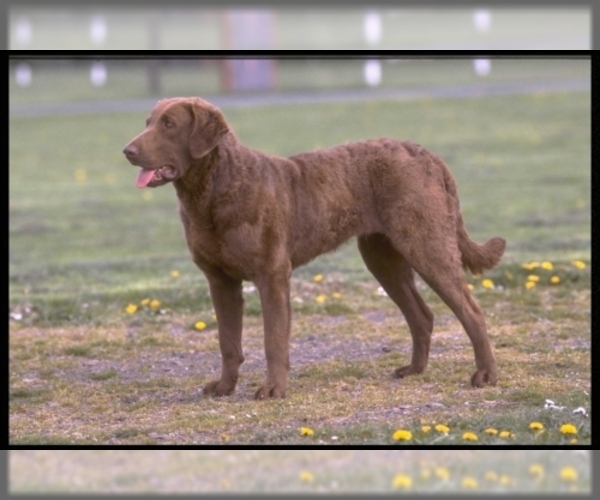 Character: Chesapeake Bay Retrievers are friendly, intelligent, and obedient. Temperament: This breed will likely chase most cats, but will get along with your own cat if you have socialized them well from an early age. They tend to try to dominate other males. Care: The Chesapeake Bay Retriever requires brushing to remove dead hairs, but care should be taken not to harm the coat's texture. Training: This breed requires obedience class and a very strong (authoritative) handler. Activity: The Chesapeake Bay Retriever needs a lot of exercise, or he may become a behavior problem. Health Issue: This breed is prone to eye problems and hip dysplasia. Posted Breed: Chesapeake Bay Retriever (medium coat). Posted Breed: Chesapeake Bay Retriever (short coat).